Chrome is on a gallop and has overtaken Firefox in South America and is running neck-to-neck in UK. 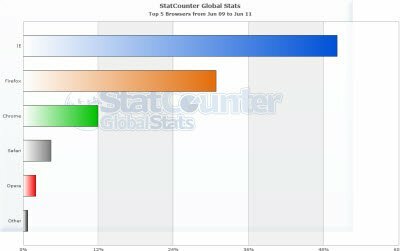 StatCounter is reporting that Chrome now has a global market share of 20.7%, Internet Explorer 44% and Firefox 28%. Safari is at 4.42% and the once popular Opera is languishing at 2%. In the US Chrome has a share of 16%, IE 46.5% and Firefox 24.7%. Chrome had a 3% market share around 2 years back and the growth in its adoption is pretty impressive. One wonders what could be the reason for Chrome’s phenomenal growth! What do you think? Good News. Would love to see Chrome overtake Firefox globally. Its invisible update procedure, being exceedingly fast and and a clean interface makes Chrome12 and IE9 my favorites. I would like to see beautiful Firefox and functional Chrome combined! !